The squad photograph for the 1960/61 has not yet been uncovered, therefore we have the team sheet from Exeter's 2-1 victory at home over Hartlepool on the 19th September 1960. 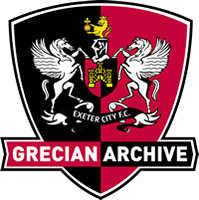 Exeter finished the season in 21st place in the Fourth Division, and exited the FA Cup in the First Round. Despite holding First Division Manchester United to a 1-1 draw at St. James Park in the League Cup, City exited after a 4-1 replay defeat at Old Trafford.